What is the evidence base for the CSNAT? 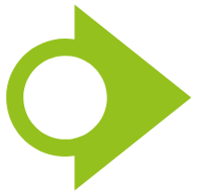 Further information about the development and validation of the CSNAT and its implementation in practice to support carers can be found by clicking here. How does the CSNAT (the tool itself) differ from other tools? Other carer tools are normally either too lengthy to use in everyday practice, or are indirect measures that only serve to indicate caregiving difficulties, not where the problems actually lie and what support would be helpful for them. (For example, the Zarit Burden Interview is only a screening measure for the level of burden a carer is experiencing). In contrast, the CSNAT asks about a simple, but comprehensive set of 14 domains and directly assesses carers’ support needs. Only by directly assessing carers’ support needs can such needs be addressed and supported. Can I use the CSNAT as an outcome measure? The CSNAT (the tool itself) cannot be used as not an outcome measure. This is because the items (questions) refer to broad domains of support needs that carers may find helpful. Thus each item is not a single ‘need’ a carer may have, but rather a question that can trigger thoughts about different types of need. A carer may indicate a need for support in a particular domain – e.g. managing symptoms and medicines – and the CSNAT conversation which takes place identifies a specific need related to e.g. understanding administration of one particular drug to the patient. The practitioner can provide the necessary information and in that sense this need is met. Therefore, if you only audit the domains (i.e. 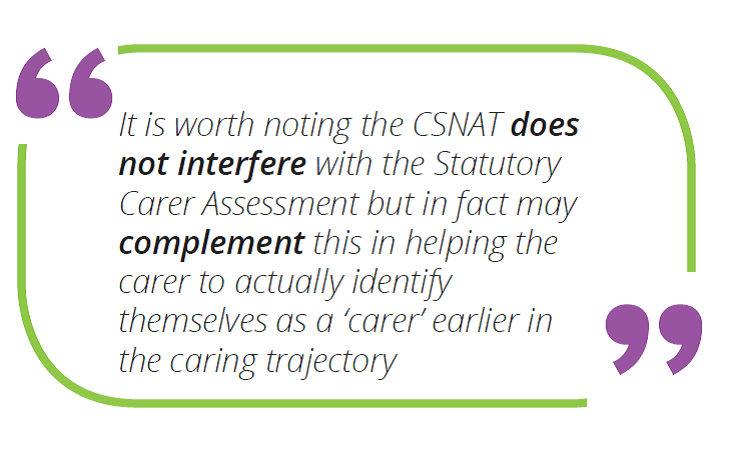 the CSNAT items) then it would appear that there was no change in the situation of the carer, whereas the assessment conversation has enabled the carer to express two different individual support needs which were subsequently addressed. Therefore a more meaningful evaluation/audit process entails recording not just the domains prioritised by the carer, but also the individual needs that were uncovered by the CSNAT conversations and usefully the action(s) taken to meet that individual need. How does the CSNAT differ from the Statutory Carer Assessment which local authorities within the UK are now obliged to provide e.g. The Care Act 2014? Whilst there may be some overlap with domains of support for the carer’s own well-being, the domains related to enabling the carer to care for the patient usually need to be addressed by a healthcare professional e.g. knowing what to expect in the future, understanding the patient’s illness. The approach taken by the CSNAT is carer-led with carers identifying what is important to them, in contrast to a more procedural assessment process. The CSNAT focuses on support needs arising from caring for someone within a long term, life limiting condition, rather than more general support needs. Why is the CSNAT answer format important for finding out what carers’ priorities are? It is well-recognised that carers are reluctant to ask for more support for themselves. When the CSNAT was developed, we decided not to use a Yes/No option for carers to indicate whether they needed more support with any of the CSNAT domains. Instead, CSNAT asks if they need ‘a little more’, ‘quite a bit more’ or ‘very much more’ support. This ensures they have the fullest opportunity to express their support needs, where the opportunity to say they need a ‘little more’ help may overcome barriers to admit they need support in the first place. Some services using the CSNAT have asked whether they can translate ‘a little more’, ‘quite a bit more’ or ‘very much more’ to a numerical scale to score how much more support a carer needs. The response categories do not represent a scale: we have no evidence to suggest that a carer who responds requesting ‘a little more’ support needs any less support than someone requesting ‘very much more’. Rather these responses are intended simply to provide the best opportunity for carers to indicate they need more support. Services do want to know which domains carers need most support with, but this is not necessarily those marked ‘very much more’. To find out the carer’s priorities, in the assessment conversation ask the carer to put a circle round the support domain(s) they most need support with. It is often those marked ‘a little bit more’. This is consistent with feedback from practitioners that the domain in which very much more support is needed is often not be the issue of most importance to the carer i.e. the one they want to talk about with the practitioner. Therefore, to apply a numerical scale to the CSNAT may result in the priorities of the carers being missed. Who is currently using the CSNAT? Click here to view the most up-to-date information on who is using the CSNAT. How can I get a licence to use the CSNAT? The CSNAT is copyright but available, free of charge for use by practitioners supporting family carers and researchers. We do have a registration process and provide a licence for organisations using the tool either in clinical practice or research.